Do you routinely walk out of the supermarket and find your grocery basket is filled with junk food? Have you bemoaned the fact that, against your better judgment, you can’t resist strolling down the cookies-and-candy aisle? Here’s an idea. Next time you walk into the store, don’t grab one of those little hand-held grocery baskets. Even if you’re only purchasing a few items, push around a shopping cart instead. It seems this simple switch could bolster your willpower. That’s the conclusion of the latest study in the fascinating field of embodied cognition — the notion, first popularized a century ago by William James, that bodily sensations greatly influence our thoughts and emotions. Researchers report the simple action of flexing one’s arm — which one does to pick up a basket — increases the likelihood of making impulse purchases we’ll later regret. “Simply flexing one’s arm leads to a preference for vices over virtues, and for smaller, earlier rewards over larger, later monetary rewards,” a research team led by Bram Van den Bergh of Erasmus University in the Netherlands reports in the Journal of Marketing Research. It appears this routine body movement induces an “I-want-this-now” impulse, weakening our ability to think long term. The researchers describe five experiments and a field study that provide evidence for this hypothesis. For the field study, they unobtrusively observed 136 randomly selected shoppers in a supermarket, taking note of whether they used a shopping cart or grocery basket. Afterward, they viewed each shopper’s receipt, noting the amount of money they spent and the specific products they had purchased. The researchers were looking for “vice products,” such as candy bars, that provide immediate satisfaction. They found those who had shopped using grocery baskets were considerably more likely to have bought such unhealthy treats. This held true even when the researchers controlled for such factors as time spent in the store, amount of money spent and the number of products purchased. In a second study, 31 women were given a shopping list divided into 12 food categories such as meat, vegetables and breads. They were presented with two items in each category and asked to choose the one they preferred. For example, in the “carbohydrates” category, they had to pick between rice and pasta. The key category was “snacks.” The women were asked to choose between a piece of fruit (an apple or orange) and a candy bar (Twix or Mars). “Participants chose their preferred products while either holding a shopping basket or pushing a shopping cart,” the researchers write. The results confirmed the findings of the field study. 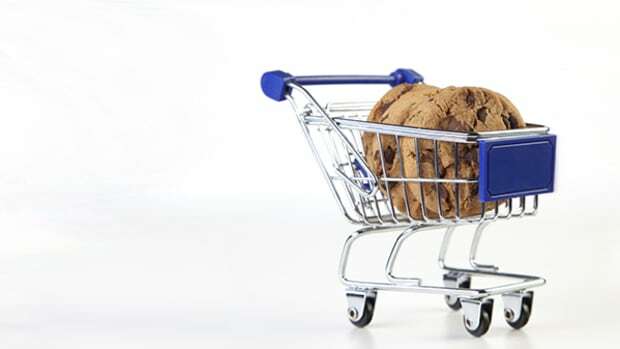 “Basket shoppers were more likely to choose the vice over the virtue than cart shoppers,” the researchers report. Specifically, their odds of choosing candy over fruit were more than three times greater if they carried a basket rather than pushing a cart. Why would this be? The researchers argue that, on an unconscious level, extending one’s arm is associated with “rejecting undesired objects.” Conversely, flexing one’s arm, which directs motor action toward oneself, is associated with “acquiring desired objects.” Think of putting a piece of food to your mouth, bringing an interesting object closer so you can examine it, or drawing a lover to your lips. This pattern gets repeated countless times throughout our lives, and in mind-body terms, it creates something of a two-way street. The act of flexing our arm to bring something appealing closer to us morphs into an unconscious belief that an object we are drawing close to us must be desirable. The implications of this finding are multifaceted. “Pulling a door to enter a building, rather than pushing the same door, could lead to purchases of products that entail immediate benefits,” Van den Bergh and his colleagues write. This implies ice cream parlors may enjoy increased sales if customers must pull open the door to enter, whereas insurance companies — which depend upon customers trading short-term pain for long-term security — would do well to let customers enter by pushing the door forward. It also suggests why old-fashioned slot machines can be so addictive. “Slot machines for which you need to pull a lever may lead to bigger revenues (than those that require only pushing a button),” the researchers write. “The fact that the lever is located on the right hand side of the slot machine, combined with the fact that most individuals are right-handed, increases the chances of instigating present-bias preferences.” Such as the impulse to put another quarter into the machine and keep the excitement going. The idea that casino owners take advantage of this phenomenon is hardly a shock; intuitively, they probably picked up on it earlier than anyone else. But it is surprising to learn we’re lowering our odds of long-term health every time we pick up a supermarket grocery basket. This study suggests that if we want our willpower to work, it literally can use a push. New research finds using bargain-brand products may deflate your self-image. Women are more likely to engage in problematic shopping behaviors during certain times in their menstruation cycle, according to newly published research. New psychological research finds credit cards make people more likely to bolster their fragile egos by purchasing luxury items. A new study finds that using motor skills while being asked to change behavior makes it more likely you'll follow the advice.